Objective: To determine the complications (infection, perforation and expulsion rate) of immediate postplacental insertion of intrauterine contraceptive device (Multiload Copper375) in postnatal patients. Aim: The aim of this study was to determine the sensitivity of the tumor markers and diagnostic methods used in the preoperative period for dermoid cysts, the most common benign neoplasm of the ovary. 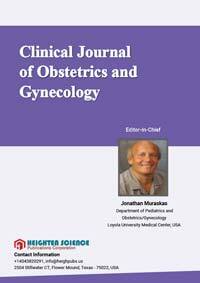 Clinical Journal of Obstetrics and Gynecology aims to publish advance research work in the field of Obstetrics and Gynecology. The scope of Clinical Journal of Obstetrics and Gynecology has to be diverse to meet the needs of advanced research. The journal has a goal to publish cutting edge advanced research in the field of Obstetrics and Gynecology.